In the history of football there will be only one Socrates. Socrates was like no other on and off the field. He is a footballer,doctor of medicine: a rare achievement for a professional footballer (he was a graduate of the Faculdade de Medicina de Ribeirão Preto. Even rarer is the fact that he earned the degree while concurrently playing professional football), painter, football coach,TV commentator, columnist for a number of newspapers and magazines, writing not only about sports, but also politics and economics, involved in Brazil’s pro-democracy movement during the time of military dictatorship that ruled Brazilian politics (spoke at street protests in the 1980s calling for an end to authoritarian rule) and made forays into writing fiction and acting on the stage. After retiring as a player he practised medicine at Ribeirão Preto. He was also noted for being an intellectual, a heavy drinker and smoker, and for his height (193 cm, 6 ft 4 in). His brother Raí (not my favourite) was a member of the Brazilian national team that won the World Cup in1994. When he died on Sunday in Sao Paulo, Brazil. He was 57.The cause was septic shock from an intestinal infection, according to a statement from Hospital Israelita Albert Einstein, where he was admitted on Saturday. The understanding he developed with the other celebrated names of Brazil’s 1982 World Cup team – Junior (king of beach soccer - my personal favourite), Falcao, Zico, Eder, Serginho – appeared telepathic. Passes were played without looking, and unerringly found their target. Socrates was so adept at the back-heel that Pele once remarked that he could play better going backwards than most players could going forwards. Socrates Brasileiro Sampaio de Souza Vieira de Oliveira was born on February 19, 1954, in the Amazonian city of Belem do Para, Brazil. His upbringing was more privileged than that of many Brazilian professional soccer players, who often rise from abject poverty. His father enjoyed reading Greek literature and named the boy after the philosopher. “Just to show that there could be no confusion he insisted on adding Brasileiro (Brazilian),” the footballer recalled later. Emerging in the 1970s as a promising young player in Ribeirao Preto, in the interior of Sao Paulo State, he studied medicine while playing for provincial teams before attaining his medical degree at age 24. After that, he moved up to Corinthians, the famous Sao Paulo club with a big following among Brazil’s poor. I am also a fan of Corinthians and have an original jersey of that club. When Socrates was a child his family moved to Ribeirao Preto in the state of Sao Paulo, where in 1974 he eventually joined the local club, Botafogo (Garrincha also played for this club). As if to underscore his unusually casual attitude to the game that dominates so many lives in Brazil, he refused to commit himself full-time to the club until he had completed his degree in Medicine at the local university. Such was his talent, however, that Botafogo allowed him to skip training sessions to finish his studies, and soon he became both a qualified doctor and the team’s star player, notching up 24 goals in 57 appearances. By 1978 he had turned professional and joined Corinthians, the club in Sao Paulo which – along with Rio de Janeiro’s Flamengo – dominates football in Brazil. At the time the country was ruled by a military dictatorship, and Corinthians had a reputation as a centre of democratic opposition, acquiring influence and significance that stretched well beyond the pitch. This manifested itself in the movement known as Democracia Corinthiana, in which the club’s directors, staff and players all had a vote to settle any decision of significance.It was an obviously political organisation, and Socrates (a self-confessed idealist who named one of his six children Fidel) was at its heart. He played for Corinthians for six years, until 1984, making 297 appearances and scoring 172 goals during a spell in which the club was champions three times. With his long, flowing locks, headband and wispy beard, backed up by outrageous skill on the ball, Socrates was an embodiment of rebel . But his rebelliousness also took a toll on his health, and he demonstrated as significant a commitment to beer and cigarettes as he did to his political ideals. It is a testament to his physical power that such indulgence had no discernible impact on his performances on the pitch. He started playing for the national team in 1979, making his debut in a 6-0 win against Paraguay, and by 1982 was captain of a group of players considered as worthy of pulling on the golden shirt as the constellation of stars which had gathered around Pele in 1970. It was a devil-may-care attitude that almost saw the side lose its first game, against the USSR. After going behind in the first half, however, Brazil came back to win the game with two of the goals of the tournament. With 15 minutes remaining, Socrates collected a Soviet clearance 40 yards from goal. Skipping over one potentially leg-breaking challenge, he feinted past another defender before unleashing a right-footed shot from 25 yards into the top left-hand corner. Then, with two minutes of the game remaining, Eder flicked up a cross field pass and volleyed the ball into the net from a similar distance; in neither case did the Soviet keeper move.It was a win which established the Brazilian players’ credentials as the showmen of the competition. Brazil’s former president, Luiz Inacio Lula da Silva, an outspoken fan of Corinthians, the club where Socrates thrived in the 1980s praised Socrates in a statement on Sunday. “Dr. Socrates was a star on the field and a great friend,..he was an example of citizenship, intelligence and political consciousness......Socrates' generous contribution to Corinthians, to football and to the Brazilian society will never be forgotten,"
Socrates seemed like a player from another era," former Italy forward Paolo Rossi told the ANSA news agency. "You couldn't place him in any category - on the pitch and even more so off it. Everyone knew about his degree in medicine and he had a lot of cultural and social interests as well. He was unique from every point of view." 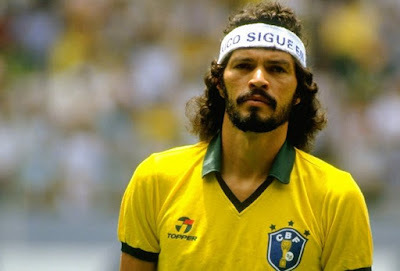 Socrates, born February 19 1954, died December 4 2011. According to me, only person who can remotely match versatility of Socrates is Rick Charlesworth of Australia. There won't be another Socrates for sure. A terrific loss for any footie fan, but all the more to those who were fortunate enough to watch football poetry, which was what the team of 80s delivered, but failed to win the coveted cup in 1978,1982 & 1986 owing to splash of individual brilliance.